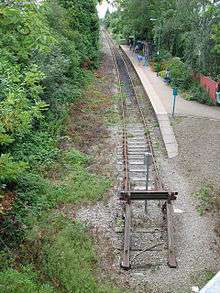 The Coryton Line is a commuter railway line in Cardiff from the city centre to Heath, Birchgrove, Rhiwbina, Whitchurch and Coryton. It was originally opened as part of the main line of the Cardiff Railway. The line is currently operated by Arriva Trains Wales (ATW) as part of the Valley Lines network. ATW replaced the previous franchise, Wales & Borders in December 2003. Rolling stock seen operating the line are normally class 143 or 142s. However, due to the occasional shortages of rolling stock it has been known to see class 150s or even 158s operating services. Services normally continue to Radyr via the City Line and then back towards Coryton. On 16 July 2012 plans to electrify the line were announced by the Government as part of a £9.4bn package of investment of the railways in England and Wales. The announcement was made as an extension of the electrification of the South Wales Main Line from Cardiff to Swansea and the electrification of the south Wales Valley Lines at a total cost of £350 million. The investment will require new trains and should result in reduced journey times and cheaper maintenance of the network. It is thought to start between 2014 and 2019. Wikimedia Commons has media related to Coryton Line.